Catalina Spas has followed up its launch of the new Dream 600L hot tub model with the introduction of the imposing Catalina Atlantic Pool option that has been manufactured with an innovative GAURD Reflex-Air coating. The Salisbury-based hot tub and swim spa distributor has been busy during the winter preparing to launch a host of feature-rich products for UK dealerships to take advantage of the booming consumer demand in the wet leisure market and the Atlantic Pool is the latest addition to the thriving Catalina Spas swim spa stable, which achieved 2015 WhatSwimSpa? Best Buy Award-winning status for the Mardi Gras and Relay 16 DT. Coming in at an imposing 21 feet long (6.35M), the Catalina Atlantic Pool is much bigger than its award-winning counterparts and has three different internal depths. Also, unlike many above-ground pools, it is fully insulated and fully self-supporting. The Atlantic Pool’s shell is produced using a two pack gelcoat fibre reinforced resin system, which is insulated with a thick layer of spray applied foam and the special radiant GAURD Reflex-Air coating is added to the inside of the cabinet. “This together with a four-piece deluxe safety/ insulation cover makes the Atlantic one of the most energy efficient and cost effective swimming pools on the market,” declared Catalina Spas Managing Director Stephen Crabb. Atlantic Pool customers have the choice of either the above or in-ground option and in four power settings. These include: Pool Only, with 1 x 2.5hp pump; The Classic, with 1 x 2.5hp & 1 x 3hp pumps and 2 river jets; The XP, with 1 x 2.5hp & 2 x 3hp pumps and 2 river jets; The Aquadynamic with 1 x 2.5hp and 3 x 3hp pumps and 3 river jets. Meanwhile, a 6kW heater and Ozone is standard on all models. Other standard features include: Variable internal depths of 1.2M, 1.37M and 1.5M; Internal Walk in Steps with highlighted tiled edge and LED lighting; 2 x 900mm exercise bars; 3 x 450mm LED Cascading Waterfalls, 2 x LED Underwater Lights; and Pro Swim and Rigid Insulation Safety Covers. The Catalina Atlantic shell is available in Ice blue, off white and blue. The PVC cabinet options are Grey, Walnut and Mocha. Optional upgrades are available and these include: 12 Crystal Water Fountains; 21 perimeter LED lights; Turbo heated air & 6 x 75mm LED under water pool lights. Similar to all Catalina Spas, swim spas and fitness pools; the new Atlantic Pool is backed with the unique Catalina ten-year warranty plan to provide customers with additional peace of mind ahead of making their purchase. Stephen Crabb and his Catalina Spas team are now promoting the new model as an ideal alternative to a traditional above-ground pool that has the benefit of being a fraction of the cost of an outlay on a pool project. “The Atlantic Pool is not just an above ground pool,” said Stephen; “It can also be sunken into the ground. “Compared to a traditional swimming pool the Atlantic Pool also gives owners massive savings. Initial outlay costs are considerably less as there is a lot less preparation needed. “The self-supporting structure of the Atlantic Pool means it can simply be dropped into place, and because all of the mechanical components are mounted inside the cabinet the only thing that needs connecting is a power supply. 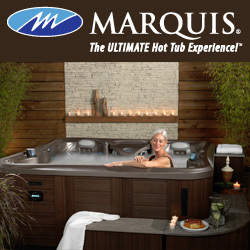 Filed Under: New products, News, News & views, Products Tagged With: Atlantic Pool, Catalina Spas, hot tub dealers, WhatSwimSpa?